The 60mm f/2.8 ticks all the boxes for a macro lens – it's sharp across the full range of apertures and produces life size magnifications of tiny objects on the sensor. It even has a focus limiter switch for faster autofocus at normal distances. A true macro prime, this lens has a magnification ratio of a full 1.0x or 1:1 at its shortest focus distance of 0.19m. In a nutshell, or other suitably small sized simile, this means that objects are reproduced on the image sensor at full life size. There's an argument for saying that, with the crop factor of the Four Thirds system, the lens actually gives an 'effective' 2.0x or 2:1 magnification factor in full-frame terms. Slim and tall, the lens measures 56x82mm and weighs 185g. More importantly, the closest focus distance of 0.19m enables a comfortable working distance in full macro mode, without the front of the lens encroaching too much on the subject. This is helped by the internal nature of the focus system, enabling the front element to remain fixed rather than rotating or extending. Trick features include a smart focus gauge with a red indicator line that moves up and down a scale beneath a viewing window, a bit like an old-school fuel gauge. Like with the 45mm f/1.8 lens reviewed, the lens hood is sold separately as an optional extra but, when fitted, this also moves forward and backward depending on focus distance, to give optimal protection against ghosting and flare. 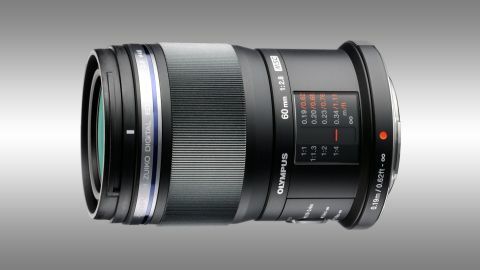 Unlike the 45mm lens, this one adds ZERO (Zuiko Extra‑low Reflection Optical) coatings for added resistance against ghosting and flare, and boasts a dust-proof and splash-proof construction. The outer lens barrel is plastic rather than metal but the overall build quality feels good and solid. A final luxury is a three-way rotary autofocus limiter switch which can lock out the short or long sections of the autofocus range, as well as enabling full travel. As an extra option, you can also turn the switch fully anti-clockwise, which has the effect of forcing the focus position to its shortest, full macro setting. Important for a macro lens, sharpness remains very good at narrow apertures, right down to f/22, which you might often want to use to extend the minimal depth of field in extreme close-up shooting. It's equally impressive at the widest aperture of f/2.8, more useful when using the lens as a fast, short telephoto with an 'effective' focal length of 120mm. This makes the lens handy for tight head shots in portraiture, without the need to infringe on your subject's personal space. Colour fringing is a little above average for an MFT lens, mostly at very narrow apertures, but it's barely perceptible in images nonetheless, and distortion is almost completely absent.